While we don’t have a vision for this site, we do have a philosophy. This philosophy drives our strategic direction and our daily operations. Our philosophy is the truest definition of what we are as a company and what we bring to our audience. This philosophy is the core of who we are and who we will continue to strive to be. 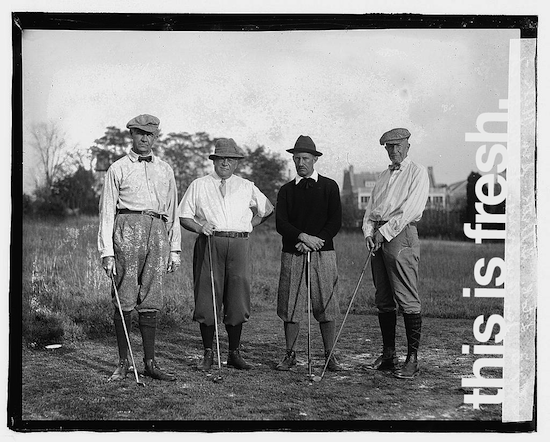 We are golfers with a passion for the game and for well-designed products. We care deeply about quality and aesthetics. We have a bias for disruptive products while having a deep respect for tradition. We believe that every golfer is better served with solid equipment that looks and performs at exceptional levels. Our reviews are biased only in our initial filtering of the products we request. We have no desire to review mediocre products. If we publish a bad review – it’s a failure of our filtering criteria and/or a failure of the companies to represent their products truthfully. We won’t publish press releases or pure technical specs – although those items do influence our drive to pick the best-of-the-best and innovative products to review for our audience. Press releases and technical specs have their place – but it’s not on Fresh. While we do respect the technical reviewers in our industry – you won’t see us publishing extensive quantitative results on our site. We are focused primarily on the qualitative analysis of products – simply because this is the way that we believe that our readers will experience the products themselves. We feel that the golf industry has generally failed to bring consumers innovative products over novelty fads. We appreciate the companies that take a chance and the companies that are embracing younger golfers and the new approaches that come along with changes in the generations that play the game. We are rooted in a deep respect for those that have played before us and for the deep tradition and legacy of the great players, architects, and industry that has contributed to what the game has become. We believe that golf was intended as a walking game and we have a bias for those that play the game as it was meant to be experienced. We love this game for all that it has been, what it currently is, and we will strive to do our part to contribute to what it will become. Excellent review and philosophy. I agree with your approach and can’t wait to read even more reviews.